There are things you can say over a cold michelada and a pile of chicharrón, things you can confide in beer, lime, salt and crackly pig skin drenched in hot sauce. You can say “I might be pregnant” or “I want to be a filmmaker” as you lick grains of salt from your lips. The fatty chicharrón fills you up and makes you bold enough to tell the truth, to let it seep through your pores. You can lament boyfriends who tell you, “You wrote my report for work, but there were muchísimos spelling errors. It made me look bad.” You can talk of the cult of the Saint of Death — la Santísima and her followers. They are the children of prostitutes, street vendors who hawk fayuca (black market goods likely made in China), petty thieves, and homeless children. “La Santísima,” they say, “is the only equality we know.” In death, they see some measure of justice, a fate that no one can escape. With the michelada you do not cry. It is not a drink for tears. There is already enough salt. You wonder why you are twenty-five and you still don’t know what you are doing with your life. How is it that you were sick last week and you did not have enough money to go to the doctor? At one time, you thought you could live on pure belief in something. Now you are not so sure. Why did that boyfriend say, “The condom broke, but I didn’t tell you, because I didn’t want you to worry.” And when you share this tragic quote with a stranger, she understands immediately, instinctively. She buys you a single cigarette from the waiter. You offer her a piece of pork skin soaked through with lime and salt. She takes the transparent shell of an offering in her palm, as if it were sacred. She reaches over and sips your michelada and tells you to go see San Judas Tadeo, the Saint of Lost Causes. On the 28th of every month, at the church of Santo Domingo near metro Hidalgo, you will find distraction. 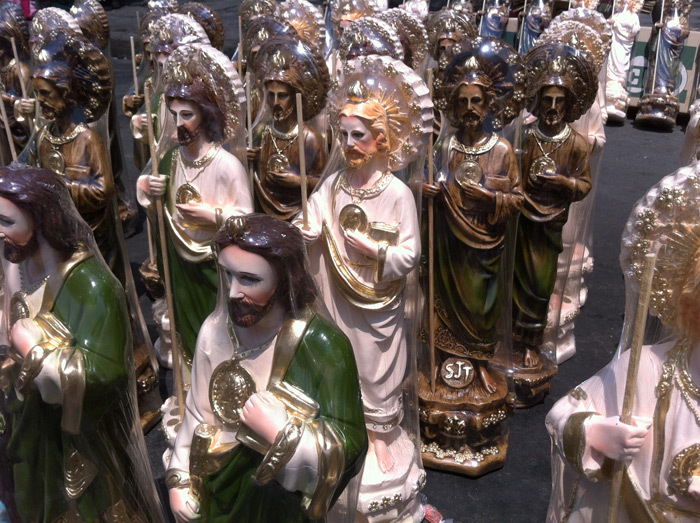 Youth with shaved heads, blue mohawks, and miles of ink on their arms carry, like a baby, statues of San Judas Tadeo. Across their midsection are slung cloth bags with the Saint’s image. And you think of lost causes, of lost people, and imagine yourself buying a statue and joining the tribe of outcasts. Alice Driver is a writer and translator based in Mexico City. The photo was taken when she participated in the monthly worship of San Judas, “The Saint of Lost Causes,” in Mexico City. She recently published “Ciudad Juárez as a Palimpsest: Searching for Ecotestimonios” in Pushing the Boundaries of Latin American Testimony: Meta-morphoses and Migrations (Palgrave Macmillan, 2012). Her interview with author Charles Bowden is featured in the August 2011 edition of the Hispanic Research Journal. She is also a contributor at Gloria Steinem’s Women’s Media Center. The writing here is wonderfully sensual, energetic and emotional with such terrific details. I love this writer’s work! This was great. Will there be more? Fascinating information, an interesting story, a beautiful voice and telling.